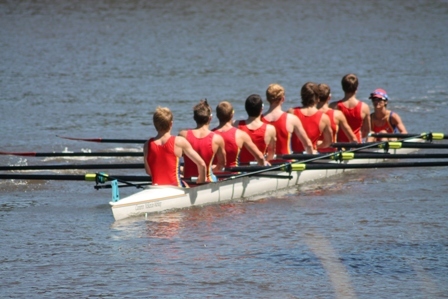 As most of you would know the boys selected rowing as their summer sport once given the chance. They begin their rowing “careers” at the end of Year 7, or the start of a season. So this is their 3rd season now. To be honest, I haven’t seen much of their rowing, mainly due to other time commitments. When they first start, it’s mainly training on the river outside their school, getting used to the idiosyncrasies of skulls (boats) and learning the tricks of the trade. By Year 8/9 they progress to regattas, their first taste of competitive rowing, and by Year 9/10 it’s hit the serious end of rowing (there’s a strong parallel to academic life it has to be said). The last time I saw the men-children row was a school only mini “regatta” with some short races to show the boys new-found skills off to their proud parents. Then they were whisked off each week to regattas on the school bus (thankfully) and our task became the early morning taxi service. Which was just as well, because when you’ve got Sister of a Man-Child with commitments each weekend (sadly full-time working parents have to cram it all in on a Saturday), it becomes difficult for parents to be in two places at once. For those who don’t know, trust me the rower’s life is not an easy one. Early morning starts (5.30am to be at school by 6), at least 3 mornings a weeks for the juniors, escalating to more than 7 training sessions a week for the seniors. In fact the boys training regime this season seemed almost too much in my view – I really thought their coach had become quite obsessed with the boys performance and was potentially pushing them too hard. They had no rest day, training sessions with some of them throwing up from the effort, and school holiday training regimes that made Biggest Loser camp look like a walk in the park! Last weekend we finally got the chance to attend a regatta, as it was thankfully in Melbourne and ran into the afternoon (all other commitments with Sister of a Man-child then complete). Sadly it was also a sweltering 38 degrees in Melbourne, but wild horses weren’t stopping me and my new digital SLR camera from being bank side to watch the boy’s row. We knew they had actually been performing very well of course, with both boys in the 10A team, but we didn’t realise until we saw them just how good they actually are! The first row past on the water they were just heading down to the start line for one of their races. I threw a casual hello (yes, embarrassing mother that I am) but they didn’t even flinch. Such was the intensity and focus on their rowing I doubt they even saw me and my father standing watching them. We both commented on our surprise at their absolute concentration, but minutes later as we watched them row, all was revealed. They are amazingly good. Their coach has produced an incredibly disciplined, focussed, dedicated, and well-oiled machine of 8 young men, who together have become an unbeatable crew. Such is their success, they are beating other crews their age by 4 boat lengths, and even beating some Year 11/12 crews. No wonder the school are sending them to compete in the National Championships in Perth next week. Father of a Man-Child and me (and the boy’s grandfather) have a new-found respect for the boys, and their coach. It’s clear he knew exactly how much he could push them, and he has certainly got the results. Of course success is certainly a brilliant motivator for all. We were delighted to be on the river that day watching them, and thrilled and proud to have both our boys in the limelight. It’s not every day you have twin boys rowing together, although it does happen. The irony of them sitting one behind the other in the boat is not lost on me – no-one watching them would know that they fight and argue at home and sometimes could kill each other, yet are forced to sit so close in a boat! It’s perfect really. And I have no doubt that looking back they will enjoy the fact they did this particular sport together. There is one other upside of rowing, apart from keeping them fit. It’s true what they say – the demands of rowing keep them out of trouble. They still have a social life, but it’s definitely tempered by their training and regatta commitments. I know for a fact they seriously curtail their drinking (yes of alcohol) during rowing season – that’s music to a mother’s ears. I hope the boys enjoy their taste of success – the medal haul is impressive, every regatta brings home yet another, and I hope they enjoy their time together – I’m sure they will look back with fondness on their time spent rowing. Here are my earlier reflections on the sport of rowing, which was all very foreign to me then. Row, Row, Row your boat.